For a continuation of the narrative that began with 2014’s Divergent, we head to 2015’s Insurgent. As we learned in the first film, a dystopian future society divides citizens into factions based on their abilities – except for “divergents”, who act as wild cards in the system. Tris Prior (Shailene Woodley) learns that she’s a divergent and by the end of the first film, she leads a rebellion against leader Jeanine Matthews (Kate Winslet). Insurgent starts with this battle underway. While Jeanine spews propaganda, Tris confronts her inner demons as she attempts to head the fight. Tris and her cohorts learn new secrets and battle against the system. That synopsis is more vague than I’d like. 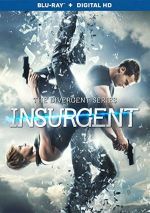 While I prefer to avoid spoilers, I try to give decent plot information, but a film like Insurgent makes that a challenge due to its placement in the Divergent series. Insurgent gives us the second of four films based on three books. (The final novel - Allegiant - will get split into two movies.) With a tale that exists as the second act in a longer narrative, Insurgent occupies a certain tentative spot. It plops us into its world with the expectation we already understand the situations/characters, and by design, it concludes without a formal ending. Being stuck in the middle doesn’t doom a movie, of course, as some genuinely great films have arrived in that position. The Empire Strikes Back acts as the classic example of a great “middle chapter” flick, and others like The Two Towers succeed in that regard as well. Those followed great “first chapters”, though, which I can’t claim for Insurgent. Divergent felt like 139 minutes of vague exposition in search of a plot, so I can’t say it made me excited to see subsequent entries. That said, I figured that with all the scenario/character basics out of the way, the series might pep up as it went. And it does, as Insurgent offers a more satisfying experience than Divergent did. That’s largely because unlike its predecessor, Insurgent shows a pulse. Divergent tended to lollygag and meander through its endless expositional sequences. By the time it got around to a little action, the results seemed half-hearted and ineffectual. Insurgent boasts a more dynamic feel. Granted, it’s easier for it to embrace action since Divergent did all the legwork, but I won’t blame the first film’s “origin story” nature for its tediousness. We’ve seen scads of movies in a similar position that managed to become exciting and fun, whereas Divergent was a snoozer. Unfortunately, the story of the Divergent remains only vaguely interesting. The roots of the society in which citizens get assigned to factions based on skills boasts potential, but the movies don’t explore the notion all that well, so we’re left with warmed-over battle-against-fascism clichés that we’ve seen a kajillion times. Like its predecessor, Insurgent still feels like a Hunger Games knock-off. Perhaps that’s not fair, but it’s inevitable, as the tales boast so many similarities. Differences exist, of course, but the overall impression remains, and Insurgent can’t quite develop its own identity. Insurgent does give us a pretty strong cast. In addition to up and comers like Woodley and Miles Teller, we find notables such as Winslet, Naomi Watts, and Octavia Spencer. It’s not exactly an all-star group, but the actors add some depth to the proceedings. And Insurgent doesn’t deliver a bad movie. It does become more exciting than Divergent, and the action revs up to a degree where I think it’s possible Allegiant might become genuinely interesting. I’ll have to discuss that another day, though. 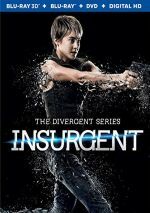 For now, I view Insurgent< as superior to the series’ first chapter but still not particularly satisfying. Insurgent shows signs of life but lacks consistency and personality. Insurgent appears in an aspect ratio of approximately 2.40:1 on this Blu-ray Disc. Like the first film, Insurgent came with an excellent transfer. Sharpness looked great. At all times, the movie showed nice clarity and definition, with nary a soft image on display. Jaggies and moiré effects failed to appear, and I witnessed no edge haloes. Print flaws also never caused distractions. Colors depended on setting. In the earthy world of Amity, the film boasted an orange feel, while scenes in the city opted for a more teal impression. While those choices seem predictable, the disc reproduces them well. Blacks were deep and dark, while shadows showed nice clarity and smoothness. This turned into a satisfying presentation. I also felt consistently pleased with the excellent Dolby Atmos soundtrack of Insurgent. Because I don’t have an Atmos-equipped system, this played back as a Dolby TrueHD 7.1 mix, and it was a good one. With plenty of action on display, the soundscape earned many chances to shine. It filled out the various channels in an active, involving manner that placed the viewer within the spectrum. Different components showed up in appropriate spots and moved/meshed well to form a solid sense of place. In addition, audio quality excelled. Speech remained distinctive and natural, while music showed good range and clarity. Effects fared best, as they seemed accurate and dynamic. The soundtrack fit the film and added to the experience. The Blu-ray comes with a nice array of extras, and these begin with an audio commentary from producers Lucy Fisher and Douglas Wick. They offer a running, screen-specific look at story/character domains, cast and performances, sets and locations, music, and a mix of other subjects. The Fisher/Wick commentary alongside Divergent became a snoozer, and their second stab doesn’t work much better. Like the first track, this one offers occasional nuggets of information, but these remain in the minority. Instead, we mainly get praise for those involved – when we’re not stuck with dead air. Expect a slow, dull chat here. Under Insurgent Unlocked, we find seven featurettes. These fill a total of one hour, 56 minutes and 32 seconds as it provides comments from Wick, Fisher, production designer Alec Hammond, 2nd AD/VFX supervisor James Madigan, author Veronica Roth, set decorator Kathy Lucas, screenwriters Brian Duffield and Akiva Goldsman, supervising art director Alan Hook, producer Pouya Shahbazian, stunt coordinator Darrin Prescott, transportation coordinator Denny Caira, 2nd unit stunt coordinator Wade Allen, executive producers Barry Waldman and Todd Lieberman, fight coordinator Jeremy Marinas, special effects coordinator Bruno Van Zeebroeck, armourer Gregg H. Bilson Jr., property master Sean Mannion, composer Joseph Trapanese, and actors Shailene Woodley, Theo James, Octavia Spencer, Kate Winslet, Miles Teller, Ray Stevenson, Jai Courtney, Ansel Elgort, Jonny Weston, Maggie Q, Keiynan Lonsdale, Zoe Kravitz, Naomi Watts, Daniel Dae Kim, Emjay Anthony, Suki Waterhouse, and Ashley Judd. “Unlocked” looks at story/character topics, sets, locations and visual design, props, vehicles and various effects, stunts and action, music, and what we’ll see in the next movies. “Unlocked” essentially offers a picture-in-picture piece. The interviews and behind the scenes footage fill most of the screen, but we can see the movie in a small box that changes place depending on the other content we view. We find plenty of good content in “Unlocked”, especially after the dull Fisher/King commentary. “Unlocked” covers a nice array of topics and does so with reasonable depth and fidelity. Expect a lot of useful material here. Five more featurettes follow. From Divergent to Insurgent goes for five minutes, nine seconds and includes info from Wick, Fisher, Goldsman, Woodley, Lieberman, Shahbazian, Teller, Duffield, James, Roth and Winslet. The piece looks at changes/development between the two movies. It offers a decent recap/overview but doesn’t prove to be especially valuable. During the three-minute, 40-second The Others: Cast and Characters, we hear from Roth, Lieberman, Fisher, Lonsdale, Anthony, Waterhouse, Weston and actor Rosa Salazar. As implied by the title, the featurette focuses on supporting roles/actors. A few decent details emerge but “Others” runs too short to give us much. Next comes the four-minute, one-second Anatomy of a Scene: The Train Fight. It offers notes from Elgort, James, Woodley, Prescott, Hammond, Hook, Allen, and Marinas. We get notes on the development and shooting of a specific action sequence. Though brief, the featurette offers a pretty good discussion. The Peter Hayes Story occupies two minutes, 40 seconds with details from Spencer, Duffield, and Teller. We find general thoughts about the Peter character. Don’t expect to learn much of value here, as the participants do little more than describe what we see in the movies. Finally, we get Divergent: Adapting Insurgent for the Screen. It runs four minutes and features Wick, Roth, Shahbazian, Lieberman and Fisher. The program examines efforts to bring the book to the screen. Some of this material already appears during “Unlocked”, but “Adapting” adds a few more details. A bunch of additional components appear in a Marketing Gallery. This includes two sneak peeks, an “In-Theater Promotional Making Of”, an HBO “First Look”, five theatrical trailers, an image gallery and animated character portraits. This turns into an extensive collection of promotional pieces. The disc opens with ads for The Last Witch Hunter, Age of Adeline, The DUFF and The Hunger Games: Mockingjay Part I. As the second chapter in a series, Insurgent works moderately well, and it improves on its predecessor. It still lacks a lot to make it genuinely compelling, though, as it feels to heavily influenced by other stories in its genre. 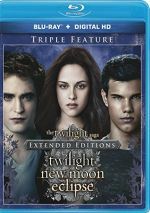 The Blu-ray offers excellent picture and audio along with a good array of bonus materials. Insurgent works better than Divergent but it still doesn’t become a particularly exciting adventure.